Easy eggplant recipes turn this with garlic and chilli into dynamite. Easy eggplant recipes make this aubergine, garlic and chilli into dynamite. This page was last updated by Bernard Preston on 9th December, 2018. This dish is really very simple, but beware of it; it's dynamite. And I must confess something of an acquired taste. My son in law calls them Amazon slugs, but tucks in nevertheless. I was brought up by a Lebanese nanny, so these odd ball Mediterranean recipes are rather unconventional to say the least. But delicious, and more important very healthy. Just look at the ingredients, not one item that's not full of goodness and flavour. It's chief health claim to fame is its cholesterol lowering properties. You'll find on the shelves of your pharmacy products containing extract of eggplant for your low density lipoprotein. Rather just eat aubergine as we call it in Holland. In South Africa they are known by the Indian name, brinjal. There are so many foods that lower cholesterol; far better to eat them regularly that take statins with their nasty side effects; do you have tingling in your legs? Husband suffering from impotence? Enjoy rather one of the many easy eggplant recipes. When you are buying them at your greengrocer, always look for shiny, dark purple fruit. Once they are old they get an unpleasant bitter taste. If you're into the low fat philosophy of food, then eggplant is right up your street; it has zero cholesterol. Let it be said up front that I don't belong to that belief; the brain is sixty percent fat and nerves are wrapped in a myelin sheath made of mainly oleic acid. If you're into the low carbohydrate together with high fat diets, then there are some question marks. Whilst eggplant is mainly water it does have quite a lot of plant sugars. But we cook and store it in olive oil, so there's your fat. I'm not into any of these crazy diets; the fashion changes every week. Enjoy your carbs, but do avoid those with a high glycemic index; white rice is top of the pops. Bad stuff. And don't starve yourself of fat, but do have plenty of those from fruits. The olive and avocado are full of the healthy fats; remember too that butter back. Polyunsaturates and margarine are now the villains of the piece. Interestingly, mice fed on a diet that gave them very high blood cholesterol, and then fed an eggplant extract, soon had normalised blood fats. Aubergines are particularly rich in anti oxidants; one of them called nasunin protects the cell membranes of the brain from free radical attack. 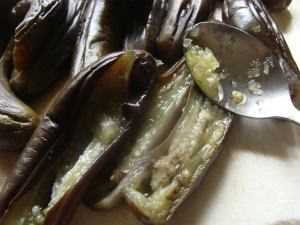 Easy eggplant recipes are amongst my all time favourites but it is an acquired taste. Two green chillies, or one red chilli, or 1 tsp of cayenne pepper. 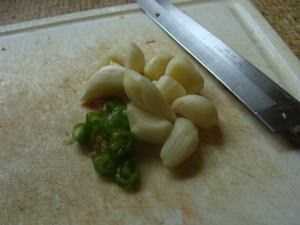 Peel the garlic and chop the chillies. 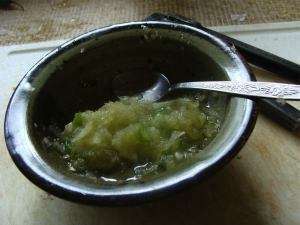 Use a garlic press or mortar and pestle to mash them up with a little olive oil; or stick blender. Or just with a teaspoon. 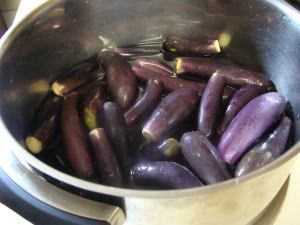 Pour the water off the baby eggplant, drain and make a small slit in each eggplant. Spoon in a little of the garlic and chilli mix. Close. Cover your stuffed baby eggplant with olive oil. 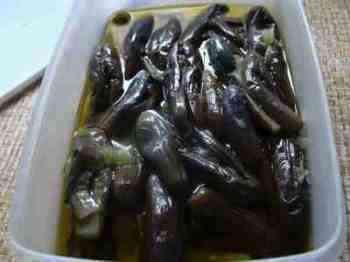 Best enjoy your Amazon slugs on bread or with a salad. Dynamite. If you have to deal with the public, then is definitely not on the lunch menu during the week. Provided your stuffed eggplants are covered with olive oil, these need more, they will keep for several weeks in the fridge. When they are finished, keep the oil for the next batch of easy eggplant recipes; or just use as a salad dressing. This eggplant goulash must be the easiest of our aubergine / brinjal recipes. Just toss the ingredients in a pot and simmer for 30-45 minutes on low heat. More EGGPLANT RECIPES including one for Ratatouille. There are few more painful conditions at the chiropractic corner than a slipped disc in the neck with radiating pain down the arm. Tingling in arms and hands, pain! SLIPPED DISC Arm pain is a condition that responds to chiropractic care, but each and every case needs to be very carefully managed. Fools rush in where angels fear to tread. Anti inflammatory foods like olive oil and chili have a part to play, so make more easy eggplant recipes. If you read just one book a month, you'll probably fall short of a thousand in your whole life, and most likely nearer 500. Enjoying a good book is like having a private conversation with the author. If you are enjoying Bernard-Preston.com, then perhaps I can invite you to a journey through the polders of Holland. That's how you can support this site, and enrich your own life with some easy bedside reading and stepping up to better health. My books are available from Amazon on Kindle. Read Stones in my Clog? Did you find this page useful? Then perhaps forward this recipe to a fellow bookworm.